>Cutting Performances challenges four decades' worth of scholarship on the American avant-garde by offering a provocative reconceptualization of the history of avant-garde performance along feminist lines. Focusing on five women artists (Elsa von Freytag-Loringhoven, Gertrude Stein, Yoko Ono, Carolee Schneemann, and Valerie Solanas) whose performance aesthetics made prominent use of collage techniques, James M. Harding sheds light on the cultural history of the avant-garde and the role that experimental women artists played in that history. He investigates the prominent position that collage technique occupied within the artists' performance aesthetic, and the decisively feminist inflection that their work gives to collage as a mode of avant-garde expression. The radical juxtapositions in their works produce the powerful effects of making the familiar strange and establishing contexts from which new understandings may emerge. 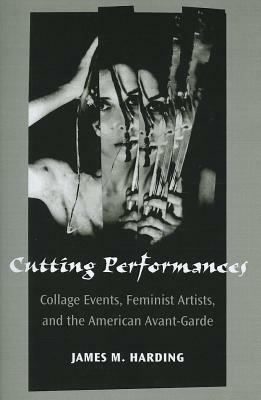 Harding examines the performative dimensions of collage in experimental, feminist redefinitions of the literary, graphic, and theatrical arts, filling a void in a scholarly discourse that, while ostensibly about the vanguard, has lagged well behind other significant theoretical and historiographical currents. Cutting Performances not only challenges assumptions that have governed scholarship on the American avant-garde but also establishes a context to rethink the history of American avant-garde performance along feminist lines. It will appeal to audiences interested in theatre history and performance studies as well as those interested in the cultural history of the avant-garde and the role that feminist experimental artists have played in it. "Cutting Performances demonstrates that feminist performances can, and should, play a crucial role in our understanding of the American avant-garde." James M. Harding is Professor of Theatre Studies at the University of Warwick.